This article is about the creature. For the biological family, see Breadbug family. Breadbugs (パンモドキ?, lit. : "Pseudo Bread") are enemies in Pikmin and Pikmin 2. These creatures remarkably resemble bread rolls; hence, they are the namesake of the Breadbug family. They cannot harm leaders or Pikmin directly, but they can drag small objects (in Pikmin) or both small and rather large objects (in Pikmin 2) into their dwellings. If Pikmin are holding onto something when a Breadbug pulls it into its nest, they will die. A larger version of this enemy, the Giant Breadbug, appears alongside these enemies in one area of Pikmin 2. Each Breadbug owns a den from which it emerges at the beginning of the day or the sublevel. Normally it trots freely around the area, ignoring Pikmin and other creatures. Once it comes across something it can drag, it will head straight for that. If it reaches such an object, it will grab it with its mouth and drag it back to its den. In Pikmin 2, Breadbugs heal themselves completely when they successfully retrieve an object. If Pikmin are already carrying an object, Breadbugs will ignore it. Breadbugs have a large amount of tough blubber, making them immune to swarming. In Pikmin, Olimar can punch them to damage them, but they will attempt to shake him off if damaged too much. When they are defeated in Pikmin 2, their dens release all the treasures they captured. Corpses Breadbugs retrieve will be permanently removed from play. So in other words, the object's weight, plus a half of the carrying support slots, plus 1, and all of this rounded down. Breadbugs will ignore objects with a weight heavier than 10 as well as all treasures in the Explorer's Friend Series. They are also unable to drag very small or flat treasures such as the Science Project or Luck Wafer. Giant Breadbugs are no stronger than regular ones and all the same rules apply. The following table lists all possible combinations of weights and max carriers with their respective amounts needed to overpower. Most of these results cannot be observed without hacking. The easiest way to kill a Breadbug is to wait until it takes hold of an object, then swarm Pikmin onto that object and return it to any Onion or the Ship's pod. The Onion or the Ship receives the object and the Breadbug takes damage by banging its head on the Onion/Ship. This method usually has to be done twice, though the first hit is so strong, it may just take one Pikmin thrown on its back to finish it off. So to better multitask, the best strategy would be to throw Pikmin on top of it once or twice, and then have it drag an object and use Pikmin to carry it the opposite way. The Pikmin should deliver the object, and more often than not, get the now-dead Breadbug and deliver it as well. It is also possible to defeat a Breadbug by throwing Pikmin on top of it, but this is slow as there is a period of immunity after each successful throw. Luckily, after being hit with a Pikmin, and finishing its pain animation, it will look left and right for some brief seconds, and during this time, it is vulnerable. By carefully timing, or by throwing a small barrage of Pikmin during this time, it is possible to hit the Breadbug again without having to move the cursor or the leader. The members of this species encountered in Pikmin move more swiftly than those in Pikmin 2, making them even more difficult to kill via this method. Using Purple Pikmin makes this method faster since their heavy weight will hurt the Breadbug, and they also try to home in as they land. Another quick way to kill it in Pikmin 2 is to use an ultra-bitter spray to petrify it, which will make it vulnerable to swarming. Strangely, Olimar can damage the Breadbug by hitting it in Pikmin even though the Pikmin cannot. In Pikmin 2, neither Olimar nor Louie is capable of hitting the Breadbug. The Breadbug's name mostly comes from it physically resembling a loaf of bread. The Japanese name further confirms this by naming it パンモドキ?, which means "Pseudo Bread". In the scientific name, Pansarus gluttonae, gluttonae comes from glutonis ("glutton"), referring to its scavenging and food-hoarding behavior. The internal name in Pikmin, collec, is likely short for "collect" or "collector". In Pikmin 2, it's just the same as the Japanese name, panmodoki. The nest the creature hides in has its own internal name. In Pikmin, it is hollec, perhaps a pun between "hole" and the enemy's internal name, while in Pikmin 2, it's a combination of パン? (lit. : "bread") and "house" – panhouse. A Breadbug in the Piklopedia. A Breadbug in the enemy reel of Pikmin. A Breadbug dragging a Female Sheargrub corpse into its hole. A Breadbug in an earlier version of Pikmin. The creature's e-card, #60 (16th yellow card). The Breadbug is one of the few enemies to have a figurine modeled after them. Its nest is very similar in appearance to the Hermit Crawmad's hole. Breadbugs seem to have cannibal tendencies: in Pikmin 2, they will carry dead Breadbugs into their nests and eat them. In Pikmin, if a Breadbug gets stuck, it will burrow into the ground after about 8 seconds and respawn out of its hole. Breadbugs exhibit behavior typical of real world ferrets, which are known to take random items and drag them into burrows or other enclosed areas. 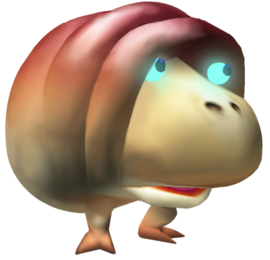 A roughly exact copy of the Breadbug in Pikmin 2 exists unused inside Pikmin 3's files. ↑ YouTube video demonstrating how Breadbugs respawn when they get stuck. This page was last edited on April 25, 2019, at 07:56.